In the realm of athletic wear, Adidas is a timeless classic. The brand is known for its roots in sports and exercise, but its iconic logo has grown to become a symbol we search for in our daily-life clothes as well. We especially like mixing our everyday wear with athletic influences or vice versa, which is why these pants are our new obsession. The Adidas Tiro ’17 Pants are an update and an upgrade of the brand’s ever-popular athletic pants. Their signature Climacool fabric directs heat and sweat away from the body, keeping us cool, dry and ready to keep on moving. Whether we’re playing soccer, running laps around the track or making the long trek from the couch to the fridge (and back! ), these pants are there to provide us with comfort and flexibility — and they come with a great sale price! See it: Get the Adidas Tiro ‘17 Pants (originally $45) starting at just $29 on Zappos! These Tiro pants have an elastic waistband with a hidden interior drawstring tie which we can adjust to fit us properly. The pants have a relaxed yet tapered look, not clinging too closely to our legs, but still creating a skinny-inspired fit that sets them apart from baggy sweatpants we’d rather leave at home. There’s also an unexpected hidden zipper at the ankle! Look closely to find the zippered hand pockets on the thighs camouflaging into the material. We’re always grateful to have zipped pockets on athletic pants so we can keep our keys and phone in them while we’re running around, not having to worry about either holding them the entire time in our hands, carrying a bag or losing them within the first 100 feet of our journey for that day. Along with the instantly recognizable Adidas logo mid-way down the left thigh, there are also three stripes down the side of each leg, diagonally cutting off right above the knee to form a sharp and sleek angle. 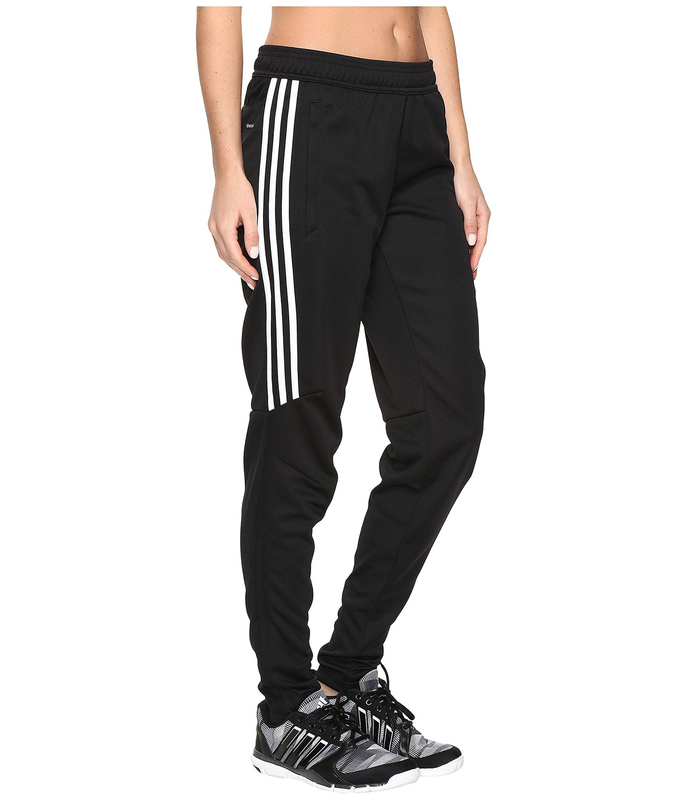 This flair gives these pants a sporty vibe we wouldn’t get from regular leggings, for example. There are currently six different options available for the color and accents of our Tiro ‘17 pants. For the extra classic look, we can choose Black/White/White, which is a black pant with a white logo and white stripes. If we only want a tiny touch of white, we can choose Black/White/Black, which is all black with the exception of the logo. Still in the black shade family is Black/Dark Grey, which is a black pant with dark grey accents subtly popping from the fabric. If we’d prefer some shine, we can choose Black/Silver Reflective instead, where the accents are a shiny, silvery-white that will reflect light back if we’re running around at night! Don’t think that a black pant is our only choice, because it’s not! Dark Blue/White/Dark Blue is a navy pant with matching stripes and a white logo. Navy’s still a deeper shade, but we can certainly choose to go brighter. Red/White/White is a stop-sign-red pant that will encourage us to go, go, go! The stripes and logo are both white on this shade. 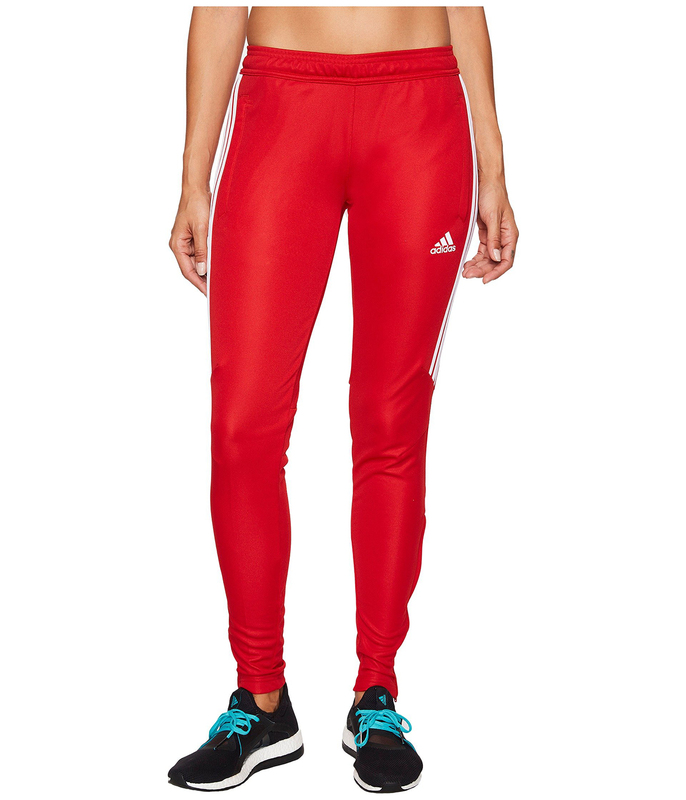 A bright athletic pant is a great pick-me-up for days when we need all of the motivation we can get. When we’re wearing these pants to the gym, we have a good amount of options to choose from for tops and shoes. We can keep it simple with just a sports bra or a tied-up tee and slip on our favorite sneakers. We can also layer up with a fleece or a hoodie, either oversized or cropped, to sweat it out in style. No matter what our fitness routine is, we can fit these pants into it. Shoppers are loving the updated version of these pants. One commented on how the airy, lightweight material keeps them from overheating, while another pointed out how the pants are so comfy, they’ve even been wearing them to bed! Another commented on how they can create a cute look by wearing these with a flannel tied around their waist. This just proves that athletic pants are a great option on or off the field or elliptical! We have to give this version of the Tiro pants two thumbs up. Adidas has done it again, and we look forward to when they do it again in the future, again! See it: Get the Adidas Tiro ‘17 Pants (originally $45) starting at just $29 on Zappos! Not your style? Check out other workout pants from Zappos here!